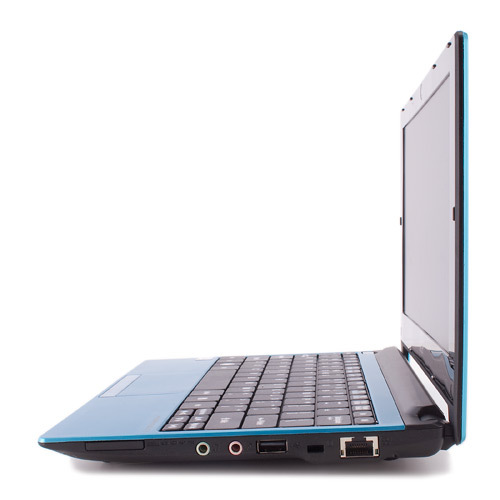 The netbook shelf is a crowded place these days, and it can be tough for buyers to see the difference among the various 10-inch, Intel Atom-powered netbooks out there. 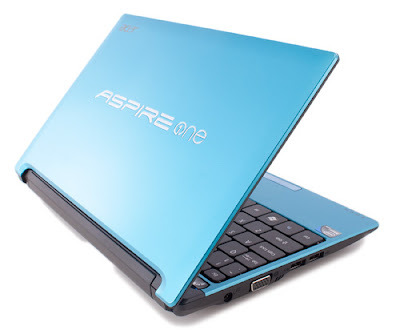 Thanks to a few above average specs, like a 320GB hard drive and a long lasting battery, the Acer Aspire One D260-1270 ($399.99 direct) stands out among a crowd of look-alike products. The small size and portability of netbooks has led manufacturers to adopt a bit of an accessory mindset when designing their netbooks, sprucing up the cheap plastics with bright colors and eye-catching patterns. While the D260 line uses lots of color, these netbooks are a little more mellow than the blaring colors of the HP Mini 210-2000 ($599 direct, 3.5 stars). Available in black, silver, burgundy, and in our case aquamarine, the D260-1270 manages to be stylish and sophisticated, embracing color in a way that won't drive potential buyers away. The molded plastic chassis is fairly light, with a system weight of 2.65 pounds. The touchpad is seamlessly molded into the palmrest, differentiated by only a subtle ridge on either side and a combined right and left button running along the bottom. Multitouch gesture support lets you scroll with two-fingered swipe, rotate photos with a twist of the wrist, and zoom in and out with a pinch to adjust content for the smaller screen. The keyboard has Acer's distinctive floating tile design, the same found on the Acer Aspire One AOD255-1203 ($329.99 street, 4 stars), which looks slick but always makes me nervous that it will collect every crumb and speck of dust that comes near it. The keyboard is the same 93% that's found on many netbooks, but full-sized keyboards can be squeezed on to a 10.0 inch model, as also seen on the AOD255. If you're used to typing on the slightly smaller keyboards found on other netbooks you'll be right at home, but coming from a full sized laptop will make this keyboard feel a bit cramped. 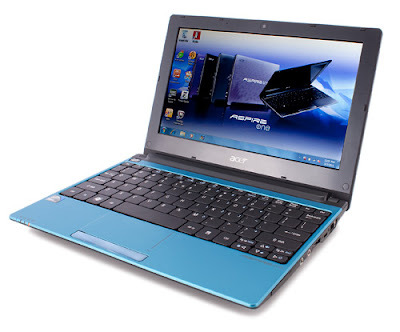 The 10.1-inch, 1,024 by 600 resolution screen is common for this price range, and is more than adequate for enjoying online entertainment and basic productivity tasks. As a rule the speakers in netbooks are mediocre, and the pair built into the D260-1270 are no exception. The sound ranges from wimpy at lower volumes to a distorted warble at high volume, and provide no low end at any volume. 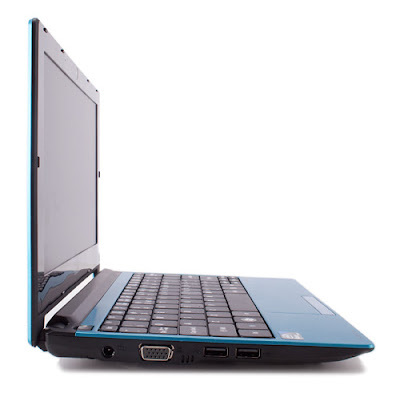 The D260-1270 has a fairly common feature set for a sub-$400 netbook. The three USB 2.0 ports, VGA output, Ethernet port, 802.11n Wi-Fi, and a memory card reader are par for the course. Acer did, however, include a 320GB 5,400rpm hard drive. It's not the fastest around—the HP Mini 5103 ($650 street, 4 stars) has a 7,200rpm drive—but it's a step above the 250GB drives found in most $400 netbooks, like the Editors' Choice Samsung NF310-A01 ($399.99 street, 4.5 stars). The D260-1270 also comes with its fair share of bloatware. Some of these are trial versions of other products, like a 60-day trial of McAfee Internet Security Suite, or a starter version of Microsoft Office that has only limited word processing and spreadsheet capability. Most of the other icons cluttering the desktop are specific services and Website links, like Skype, a NY Times reader, and links to eBay and Netflix. 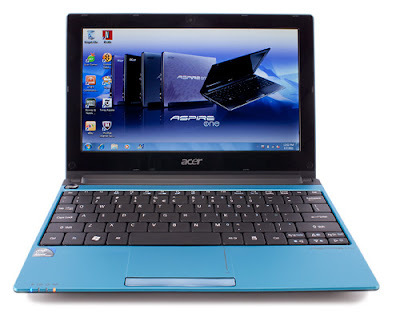 Acer Aspire One D260-1270 The D260-1270 is equipped with the 1.5GHz Intel Atom N550, a dual-core processor made for netbooks, and is the same processor found in the HP 5103 and Asus EeePC 1015PEM ($370 street, 4 stars). Though it has a fairly common processor, it does benefit slightly from the 2GB of RAM that comes standard, which slightly improves performance over other netbooks on the market [[why? What do other netbooks come with?. Performance scores are just a hair higher than similarly equipped competitors, thanks to the 2GB of RAM that come standard in the D260, scoring an overall SYSMark score of 43 and a Cinebench R11.5 score of 0.50. 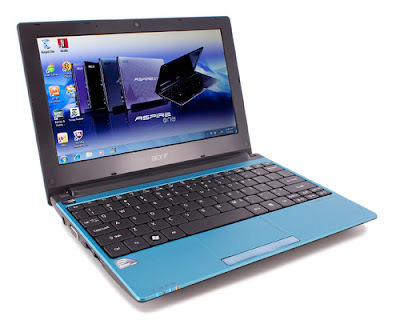 Most other Atom powered netbooks come with 1GB, and reflect this in their slightly lower scores, like those of the Samsung NF310-A01 (38, 0.48) or the HP Mini 5103 (42, 0.48). However, Intel isn't the only game in town for netbook processors, and you'll see some better scores if you're willing to shell out a bit more money for a laptop with an AMD E-350, like the Editors' Choice HP Pavilion dm1z ($449 direct, 4.5 stars) which scored 59 overall in SYSMark and 0.60 in Cinebench R11.5. The greatest benefit of the Intel Atom processor, however, is efficiency. When combined with the 6-cell (49Wh) battery, the Acer Aspire One D260-1270 lasted an impressive 9 hours 4 minutes in MobileMark 2007. The HP Mini 5102, with a 66WH battery, did better as it lasted 10:52 but . But the Samsung NF310-A01, with a similar 48WH battery, lasted only 7:05, 48Wh), and the HP 5103, which a 66Wh battery, lasted 8:40. The Acer Aspire One D260-1270 manages to provide the full netbook experience, plus larger storage and longer battery life, and does it all for an aggressively low price. Though it's easily topped by the consistently better scores of the Editors' Choice HP Pavilion dm1z, the D260-1270 shows that even with several sub-$400 netbooks on the market, even small differences can make a system stand out.